The Timber Seasoning Shelter, built at Hooke Park, is a building, and research project, utilized to store and season timber. 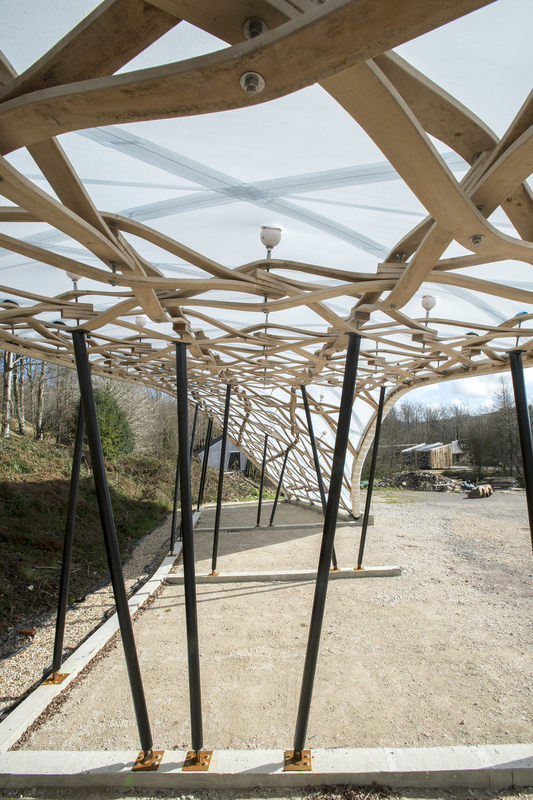 Hooke Park has lacked a space for seasoning and storing milled timber in the past. This project fills that void. It is designed and constructed by four Masters students, in tandem with local craftsmen, a group of international volunteers, and Arup engineers, as part of the Design and Make – Master of Architecture degree at the Architectural Association. The building project is oriented toward material research. The canopy is primarily made of Beech (fagus sylvatica) grown locally within Hooke Park, a woodland owned and managed by the Architectural Association, in the rural context of Dorset, England. 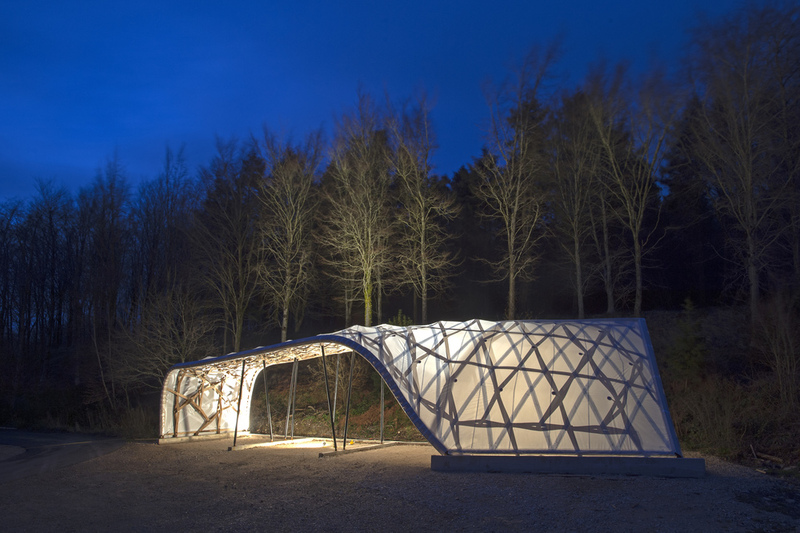 The project developed in response to the needs of Hooke Park as a functioning forest and an educational resource. The primary species within the forest is Beech. Through a deep investigation into its material potentials, the team discovered that it was, in fact, the strongest and hardest wood native to England, and that there is a deep tradition of its use in steam bent furniture, however, at present, it is merely left in the forest to rot, or sold as firewood. Its relative value in the construction industry is negligible. The Beech thinnings are felled to maintain the overall health of the forest. This proved to be the critical design challenge for the team, to utilize this material, culturally considered waste, in a cost-effective and structurally innovative manner. 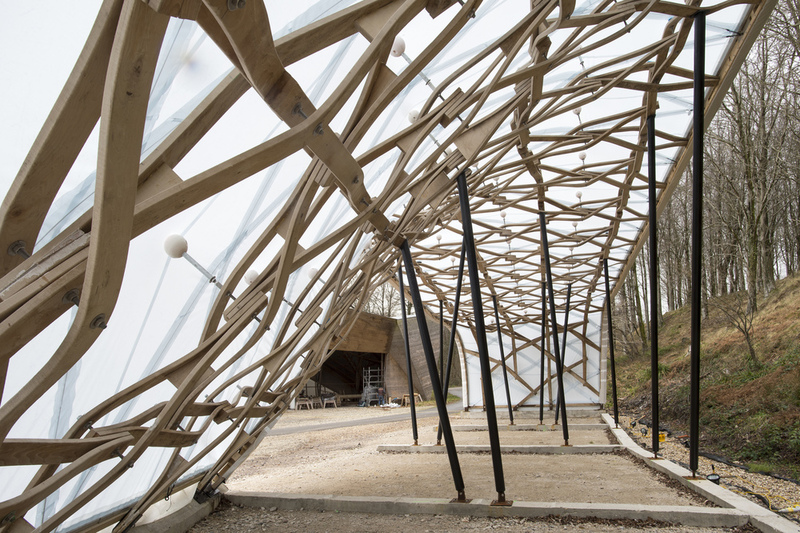 These constraints from the forest were embraced and as a consequence, the team conceived of the canopy as a reciprocal frame structure utilizing the short length, low-grade timber thinnings extracted from the forest surrounding the site. Each member of the reciprocal structure was steamed and bent to allow for greater structural depth within each member, and additionally, to allow for the formal configuration of the structure. By capitalizing on Beech’s inherent malleability, steam bending each piece proved to be the correct technique for achieving a simplified planar joinery. 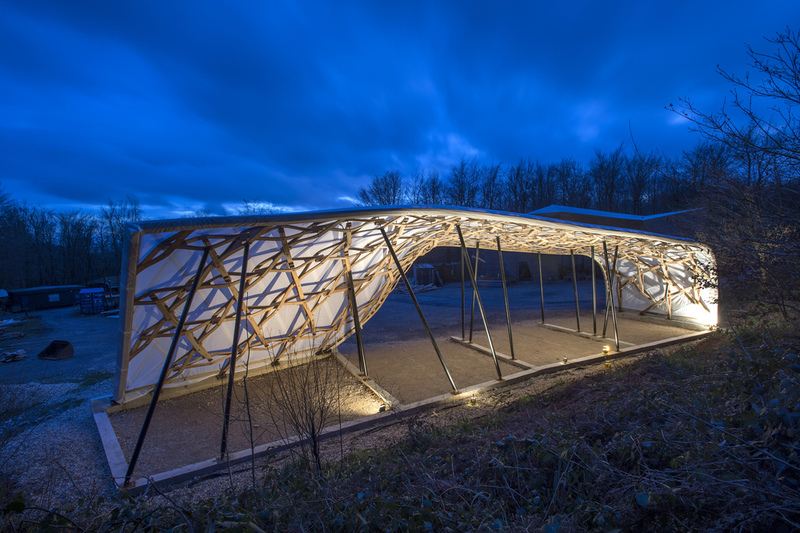 In doing so, the team created a network of trusses without notching or carving or subtractive machining of any material. In other words, less wasteful, and an alternative to other digitally driven construction precedents. The team aimed to navigate the contemporary field of digital fabrication by engaging with material directly from its source, integrating digital and analog methods of fabrication together, and intimately engaging with the specific potentials of materials available. 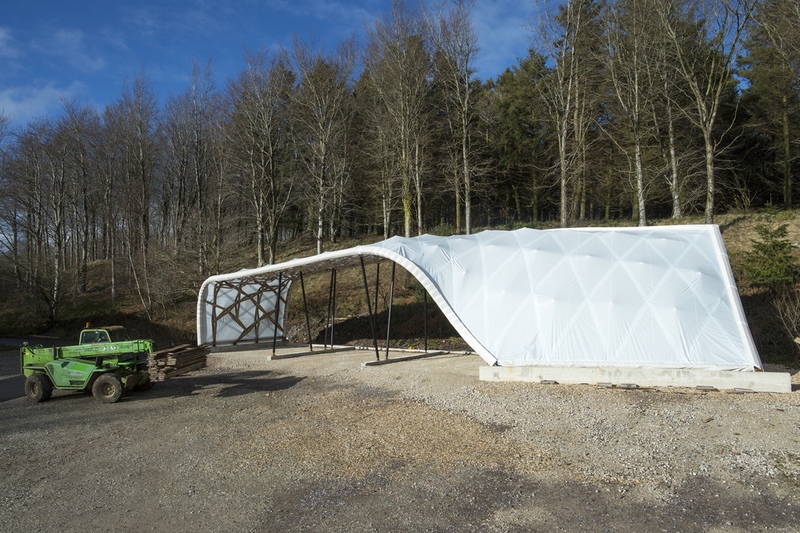 The result is an incredibly lightweight canopy employing just 4 cubic meters of material, which covers 200m2 of space. Its three main bays provide easily accessible storage space for 150m3 of lumber. It is a simple structure, however, the project speculates on what is achievable when architects engage with the making of design, and use simple, effective, approaches to construction. It exemplifies what is achievable with low-grade materials, considered waste, and counters the current architectural trends of digital fabrication, using complex machinery in favor of a more considered level of craftsmanship that demands human intuition, interaction, and ingenuity. The Accumulated Watchtower was designed as one of three Core Studio projects within the Design and Make Graduate program at the Architectural Association School of Architecture. The Watchtower, completed in the first term of the 2012 - 2013 academic year belongs within a broader discussion of making that takes place at the AA and specifically at Hooke Park, the AA's woodland campus. Hooke Park is located in southwestern England approximately seven miles north of the English coast. This considered, the project aims to emphasize the role of site and its surrounding context. The starting point for the project was first and foremost to understand Hooke Park as a woodland and how an intervention might interact with that woodland. We quickly discovered that forests are places of complex biodiversity and phenomenological sensation. They are filled with light and shadow, life and death and layers of meaning. 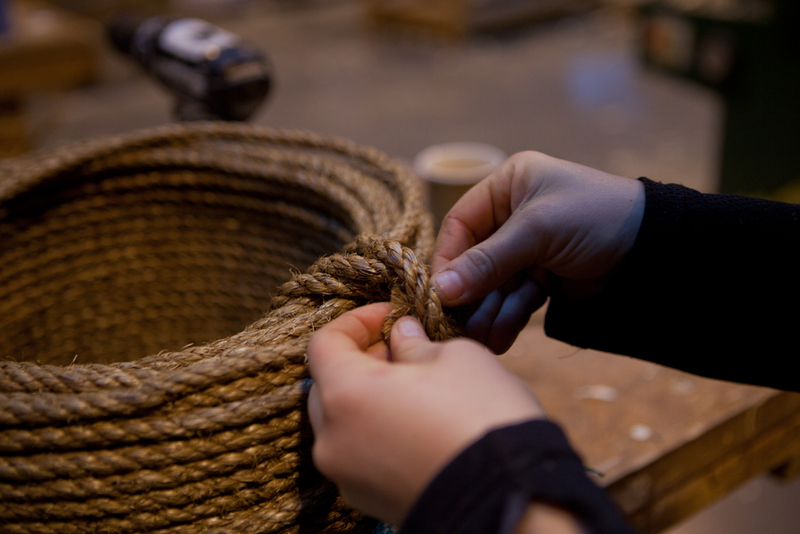 Our desire was to explore these meanings through a process of tactile making. In essence the Accumulated Watchtower is a study in tectonics as much as it is an experiment into an intuitive design process. In his epilogue from Studies in Tectonic Culture, Kenneth Frampton states that even today tectonics still maintains the power to resist. This resistance is powered by the possibility that tectonics can and should be a tactile act. One in which structure is handled first hand, through the labour of the body. "For all it's marginality, tectonic culture still possesses a vestigially resistant core, particularly as this is manifest in its proclivity for the tactile". - Kenneth Frampton - Studies in Tectonic Culture: The Poetics of Construction in Nineteenth and Twentieth Century Architecture.